Nutrients, Metabolic wastes, Respiratory gases, Hormones, Water, Hydrogen, Chemical substances and heat, heat Phagocytic leucocytes that kill and engulf harmful micro-organisms. Intracellular circulation is found in all living cells and unicellular organisms (e.g. Paramoecium). 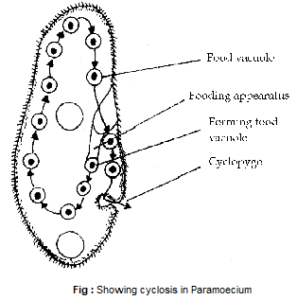 Cytoplasm shows a streaming movement (= cyclosis). It also helps in the formation of pseudopodia for amoeboid locomotion (e.g. Amoeba). 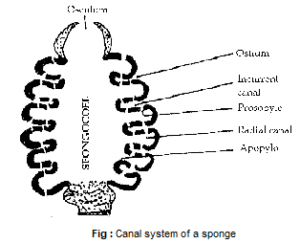 Water Circulation can be seen in coelenterates and sponges. These circulate surrounding water through their body-cavities. In coelenterates, there is a body -cavity called gastrovascular cavity (= coelenteron). 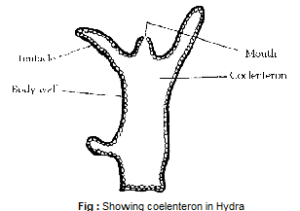 Coelenteron opens outside through an aperture.Mouth incoming water current brings food and oxygen to different cells and the outgoing current carries waste products including carbon dioxide. Parenchymalcirculation can be seen in flatworms, liver fluke (=fasciola), in which there is no body-cavity. Spaces between the body wall and internal organs are filled with parenchyma which transport digested food diffused from the intestine. Body – cavity circulation can be seen in roundworms, which have pseudocoel (= false coelom) filled with pseudocoelomic fluid, which transport food diffused from the intestine. Blood vascular circulation can be seen in higher invertebrates (from Annelida onwards)and all the chordates. It consists of the heart, blood vessels and blood. The heart is a modified blood vessel. Blood flows through blood vessels. Circulation of blood is due to pumping action of the heart. Pheretima has 4 pairs of hearts with muscular, pulsatile walls and valves. Heart of Palamneus contains oxygenated blood and of fish contains deoxygenated blood. l Open circulatory system is found in arthropods and some molluscs (mussels, snails). á Blood (= haemolymph) flows into spaces called sinuses (= haemocoel). á Haemolymph is in direct contact with the tissue fluid. á The respiratory pigment, if present, is dissolved in the plasma of the haemolymph. Haemolymph does not transport respiratory gases in insects. ♠ The closed circulatory system is found in some annelids (Pheretima), some molluscs (Sepia) and all vertebrates. á Blood flows in blood vessels and never comes in contact with tissue cells. Systemic circulation transfers oxygenated blood from the heart to all of the body tissues and returns deoxygenated blood from the different tissues to the heart. In lizard and crocodiles, there is a foramen of Panizza in between tow systemic arches. Pulmonary circulation transfers deoxygenated blood from the heart to the lungs and carry deoxygenated blood from the lungs back to the heart. 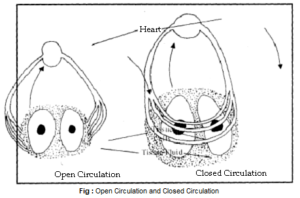 Portal circulation does not depend on the heart. It includes specialized vascular channels (= portal veins) that carry blood from one organ to another, instead of sending blood directly to the heart. Three types of portal veins conduct portal circulation. Hepatic portal vein transfers blood from the digestive tract, pancreas and spleen to liver. It occurs in all vertebrates. Renal portal vein transfer blood from the posterior zone of the body to the kidney. It occurs in lower vertebrates (fishes and amphibians), reduced in reptiles and aves(birds), and is absent in mammals.